To contact the Council, please call 01782 782254. The Town Council’s Easter film for children will be LEGO MOVIE 2 and will be held on Wednesday, 17th April, at 4:00pm at the Victoria Hall. More information can be found by clicking on the events page. Please contact the town Council to book places. Kidsgrove Town Council shared a post. Are you looking for something to occupy your children today? There are still places available for this free film showing! 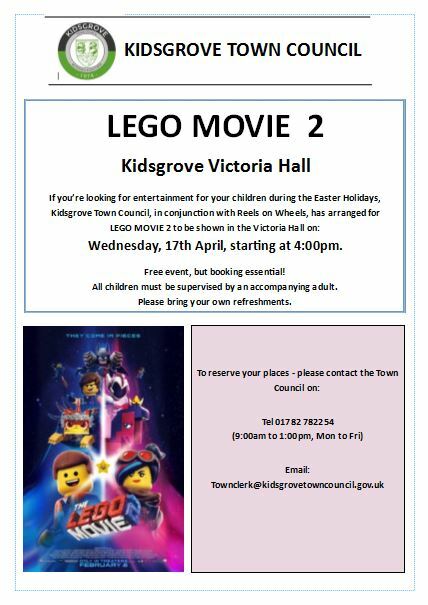 Please call 01782 782254 to book your places!Don't forget to book your places for the Kidsgrove Town Council Easter Film - LEGO MOVIE 2!